Every year in the Spring I start watching the peony plants. From their first little pink shoots, to the dark green leaves, and then finally, finally, the buds. And the buds, and the buds. It seems like forever that the buds stay there, getting only imperceptibly bigger each week. Usually, about the time I've given up on them opening at all, WHAM. They haven't just opened, they've exploded. And oh, does it smell amazing back there. I usually just let them be, enjoying them while they last in the garden. But this year, my three-year-old daughter and I have a new ritual, invented by her. Each Saturday, in the last morning, we take a small canning jar full of water out the garden with a pair of scissors and we pick flowers to grace our table for the coming week. It all started with the tulips, and then with the dandelions, and now it's just part of what we do each week. 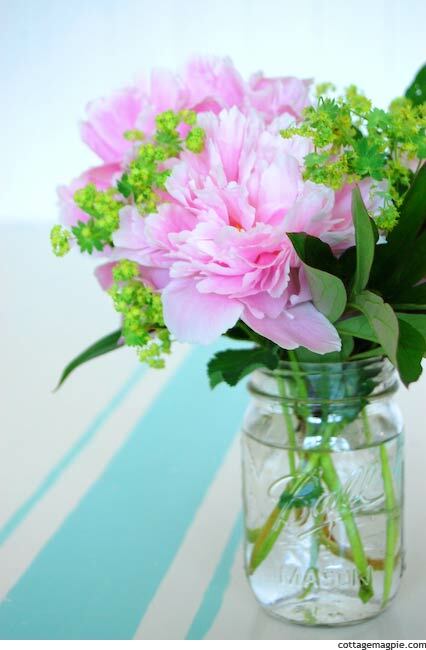 So, this week, of course, we had to pick the peonies. We decided to keep it simple and just pair them with a little bit of Lady's Mantle, and bring them in. I love them. Having fresh flowers in the house is new for me. I have had them before, usually big bouquets of whatever was happening outside in a big pitcher (like the one on my mantel from last year). But then they would get all gross and I couldn't deal with them and they'd sit. And so I wouldn't get more. But these little bouquets, they're fine. They're small enough that I can just grab the jar, toss the spent flowers in the compost and start again. It's nice! I didn't think I was meant to have fresh flowers in my home, but it turns out I just needed to find a way to have it work for me. I love making those discoveries. The other big project I've been working on is finally painting my workshop table. I'll show that more tomorrow, but meanwhile, here's a sneak peek! 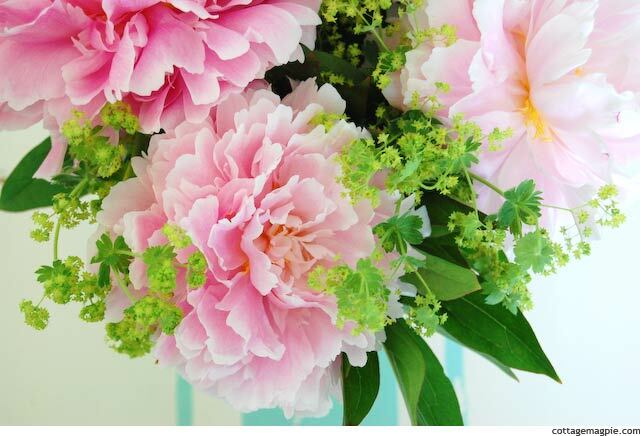 What about you, do you have peonies in your garden? P.S. Linking up to The Dedicated House, My Uncommon Slice of Suburbia, Creative Cain Cabin.